ONCE A CUSTOMER, ALWAYS A CUSTOMER will make you view your organisation and customers in a new light. It shows beyond doubt that exceptional customer service can help any company to beat its competitors. 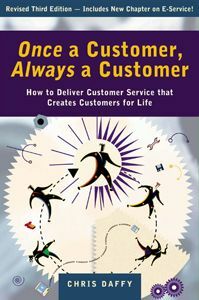 In this revised third edition — which includes a new chapter on e-service — Chris Daffy provides practical advice and real-world examples from Europe, the US and elsewhere on service strategies and techniques that will make you “famous for service”!